1. 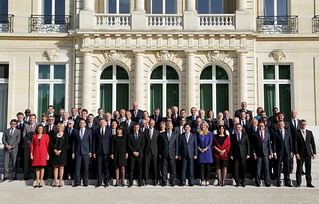 On the occasion of the 2015 OECD Ministerial Council Meeting, we have assembled under the Chairmanship of the Netherlands and the Vice-Chairmanship of the Czech Republic, France and Korea on 3-4 June to discuss how to unlock investment to promote stronger, more inclusive and green growth; boost productivity; and create more and better jobs. 2. We welcome the re-appointment of Mr. Angel Gurría as Secretary-General of the OECD, from 1 June 2016 until 31 May 2021, congratulate him on his leadership and efforts to enhance the relevance and impact of the OECD, and look forward to continuing our work together on delivering “Better Policies for Better Lives”. 3. The four major international processes in 2015 reinforce the importance of achieving inclusive and environmentally sustainable global economic policies in the near and longer term. We took stock of the overall positive impact of lower oil prices and monetary policy easing in many countries, and will look to ensure that accommodative financial conditions translate into improvements in the real economy. We underline the importance of structural reforms to improve growth prospects and boost employment and strengthen economic resilience. We agree that measures to support demand, promote investment and resist deflationary tendencies remain necessary, and underline that a robust recovery requires a balanced approach to fiscal, monetary and structural policies. 4. We recognise the important role of the OECD in the international policy landscape, including its contributions to the work of G-7 and G-20. We are encouraged by the ongoing efforts of the OECD to enrich its analytical frameworks and methods, including its tools for long-range analysis. In particular, we welcome the Final Synthesis Report on the New Approaches to Economic Challenges initiative and recognise the importance of indicators beyond GDP including OECD work on How’s Life and Green Growth indicators. We call on the OECD to further mainstream multidimensional analysis, including the work on inclusive growth and gender equality, in flagship publications. We recognise the importance of addressing inequalities and the value of social dialogue in achieving more inclusive growth and quality jobs. 5. Today global private and public investment remains below pre-crisis levels. We acknowledge – in line with the central theme of the MCM 2015 - the essential role of productive investment to promote sustainable and inclusive growth, drive job creation and support the transition to a low-carbon resilient economy. We underline the need to unlock investment, by enhancing confidence, addressing the enabling environment, adopting better regulation and targeted public spending. 6. We exchanged views on policies aimed at boosting the level, the quality and effectiveness of public investment, including in infrastructure, to support job creation and increase private investment. We welcome the focus of this year’s OECD Economic Outlook on investment and we call on the OECD to continue tracking and analysing investment trends. We call on the OECD to continue the work of the Freedom of Investment (FOI) Roundtable as a platform to collect and exchange best practices on investment issues, and encourage it to work together with developing countries and other partners (including business, civil society and international organisations). We welcome the Recommendation on – and the updating of - the OECD Policy Framework for Investment (PFI) and encourage its broad use, including in the context of the Sustainable Development Goals (SDGs). We ask the OECD to explore developing PFI indicators to help inform countries’ progress in adopting policy reforms. 7. We welcome progress on the OECD/G20 Base Erosion and Profit Shifting (BEPS) project and Automatic Exchange of Information. We urge all states and jurisdictions to join and implement the multilateral Convention on Mutual Administrative Assistance in Tax Matters, to improve the availability, quality and accuracy of beneficial ownership information and encourage them to sign the MCAA. We welcome the commitments to implement the Common Reporting Standard by 2017 or 2018. Regarding the transparency and exchange of information on request for tax purposes, we support further OECD work to explore possible tougher incentives and implementation processes to deal with those countries which fail to respect Global Forum standards on exchange of tax information on request. 8. We welcome progress in the revision of the OECD Principles for Corporate Governance and the Guidelines on Corporate Governance of State-Owned Enterprises. We encourage the OECD to continue its work on Responsible Business Conduct (RBC) in its current multi-stakeholder setting, building from the Multinational Enterprises (MNE) Guidelines. We reaffirm the importance of the OECD Declaration on International Investment and of non-Members adhering to it. We encourage efforts to widen adherence to the MNE Guidelines, and invite the OECD to study options in that regard. We also call on the OECD to continue its efforts to further strengthen the performance of MNE National Contact Points, including through voluntary peer reviews and the exchange of best practices. 9. We recognise that innovation is critical to increasing productivity and creating new jobs and requires more public and private investment in knowledge-based capital. We welcome the update of the OECD Innovation Strategy and the focus on further strengthening evidence-based innovation policy. Besides basic research, public funding for R&D should also aim at effectively leveraging private investment, facilitating the development of young innovative firms and increasingly be oriented towards global challenges. Successful deployment of new technologies and business models by both existing firms and young challengers, including SMEs, requires innovation-friendly regulation, in particular for the data driven economy, and efforts to improve the quality of human capital. We fully acknowledge that the fast pace of technological change is creating opportunities for new, more sustainable production and consumption models and welcome OECD’s work on enabling the next production revolution. We discussed the growing role of cities in fostering entrepreneurship to promote a more resilient and sustainable economy and society. 10. We further agreed that investment in people’s skills and life-long learning, boosts economic growth, enables access to employment and good quality jobs, addresses inequalities and improves social outcomes. We note that individuals without adequate skills face a high risk of economic and social exclusion, and poor health. We reiterate our call to invest in skills that are relevant to labour market needs to reduce skills gaps, enhance employability and increase economic opportunities, in particular through more effective vocational training. In this regard we welcome OECD initiatives targeting under-represented groups, including on gender equality, youth employment, ageing society and the integration of migrants. We call on the OECD to give further consideration to skills-related challenges arising from technology-induced changes in labour markets and from global value chains (GVC). 11. We recalled the 2014 Ministerial Statement on Climate Change and remain committed to supporting an ambitious outcome at the COP21, working in close co-operation with the French Presidency and other countries. We call on the OECD to continue supporting international climate change negotiations, including through further joint work with the IEA, ITF and NEA. In this regard, we welcome the Aligning Policies for a low-carbon Economy as an important contribution towards this goal. A better alignment of policies within and across countries can boost the overall effectiveness of climate policies. We recognise the importance of continued OECD work on the enabling environment for leveraging and tracking climate finance, including private flows. We also look forward to further work on effective policies to tackle climate change, including market-based approaches, export credits, and innovation, as well as the analysis of the policies to finance the low-carbon transition, including through taxation and leveraging of private climate investment. We welcome OECD work on the phasing out of inefficient fossil fuel subsidies. We call on the OECD to continue work on the role of technology in addressing the global climate challenge. 12. Managing water in a sustainable, integrated and inclusive way is necessary for sustainable development and to strengthen climate adaptation efforts. We welcome the OECD Principles on Water Governance and invite the OECD to develop a Recommendation that updates and consolidates existing recommendations on water and to report on progress at the MCM 2016. 13. We underline that international investment and an open, rules-based multilateral trading system are key drivers for private sector development, sustainable economic growth and job creation. We also welcome WTO-consistent and WTO-supportive bilateral, regional and plurilateral initiatives aimed at promoting trade. We call on countries to deliver on trade policy actions that support more inclusive growth, and strengthen the links between trade, investment and sustainable development, including through Aid for Trade, acknowledging that the full integration of developing countries in the global economy is to the benefit of all countries. We reaffirm our standstill and rollback commitments to resist all forms of protectionism. We call for the implementation of the WTO Trade Facilitation Agreement and all the other elements of the WTO Bali package, including the finalisation of a credible and meaningful post-Bali work programme aimed at facilitating the conclusion of the Doha Development Agenda. We encourage the OECD to continue its research on trade-related policy. We support the expansion of the Services trade (STRI) and the use of its analysis. We call on the OECD to deepen its analysis of GVCs, including in relation to the shift from manufacturing to services and the implications for skills and labour conditions; on measures to encourage participation of firms from developing countries; on the role of RBC; and on the impact of GVCs on inclusive growth and employment. We encourage the OECD to continue its work on the trade of raw materials. 14. We called for an ambitious Post-2015 Development agenda. We recognise the contribution the OECD can make to the Third International Conference on Financing for Development in Addis Ababa, in July, and to the UN Summit to adopt the Post-2015 Development Agenda in September 2015, in New York. The role of the OECD in fostering policy coherence for sustainable development and knowledge sharing is important in this regard, and we reaffirm our commitment to promote its contribution to the success of the post-2015 agenda. We welcome the preparation of a strategic response to guide OECD support of the SDGs, recognising that the process to develop the post-2015 Development agenda is still ongoing. We call on the OECD to contribute to the global mobilisation of resources, including through the dissemination of the updated PFI, by exploring good practices in public-private partnerships, and by supporting developing countries’ tax capacities through its Tax & Development work. We recognise and support the role of the private sector as a driver of development and poverty reduction. We note the role of RBC in enabling firms to better contribute to economic development, sustainability, inclusivity and social progress. 15. We reaffirm our respective ODA commitments, including those of us who have endorsed the UN target of 0.7% of GNI as ODA to developing countries and agree to continue to make all efforts to achieve them. We also reaffirm our commitment to allocate more of total ODA to countries most in need and to reverse the declining trend of ODA to LDC’s. We acknowledge the increasing contribution of South-South and triangular co-operation to identify new sources of development finance. We welcome the modernisation of the OECD DAC statistical measurement framework including the work on the Total Official Support to Sustainable Development measure. We call on the OECD to share its expertise in building statistical capacity of developing countries and leveraging its platforms and networks - including through the Global Partnership for Effective Development Co-operation (GPEDC) and the Development Centre - to support an effective policy dialogue. We will step up our efforts to ensure the most effective use of all forms of development finance, working with the GPEDC, in the build-up to the 2016 Global Partnership HLM in Kenya. 16. We welcome the progress made by Colombia and Latvia in their ongoing accession processes, and the opening of accession discussions with Costa Rica and Lithuania. We recall that applications for accession are considered individually. We support strengthening relations with Key Partners. In this regard, we welcome progress made with both China and Indonesia on developing respective joint work programmes, as well as the signing of an Agreement with Brazil that will facilitate the identification of mutually beneficial priorities. We welcome the significant progress made in the first year of the Southeast Asia Regional Programme (SEARP) and encourage to further build its momentum in co-operation with regional partners. We welcome the launch of Country Programmes for Kazakhstan, Morocco and Peru, and called for the renewal of the mandates for the MENA-OECD and the Eurasia Competitiveness Programmes. We invite the OECD to consolidate the activities in the Latin American and Caribbean region through a strategic framework and to consider the establishment of a regional programme that could be launched at the MCM 2016. We ask the OECD to further strengthen its regional programme with Southeast Europe and to continue working with Ukraine. We call on the OECD to strengthen the regional component of its work with Africa. 17. We look forward to reconvening at next year’s Ministerial Council Meeting under the chairmanship of Chile. Ministers and representatives from Australia, Austria, Belgium, Canada, Chile, Colombia, Costa Rica, the Czech Republic, Denmark, Estonia, Finland, France, Germany, Greece, Hungary, Iceland, Ireland, Israel, Italy, Japan, Korea, Latvia, Lithuania, Luxembourg, Mexico, the Netherlands, New Zealand, Norway, Poland, Portugal, the Slovak Republic, Slovenia, Spain, Sweden, Switzerland, Turkey, the United Kingdom, the United States and the European Union. Financing for Development in Addis Ababa, Summit on Sustainable Development Goals in New York, COP21 in Paris, and the WTO Ministerial in Nairobi. Multilateral Competent Authority Agreement on the Automatic Exchange of Financial Account Information.